It seems impertinent — indeed hypocritical — to say so here, but I’ve never been a fan of the idea of setters’ blogs. Crosswords are like magic tricks: the very best are miracles whose inner workings it would be a sacrilege to reveal, whilst the others are perhaps best not scrutinised too closely. A Paper Construction is, of course, in the second category, and I can’t remember much about how the setting went anyway, so that aspect of a setter’s blog is ruled out. However, the space constraints for the solution notes didn’t allow me to witter on about the geometry at much as I would have liked, so many thanks indeed to the LWO folks for giving me the chance to do that now. I don’t know whether the designer of the printed grid was aiming for a 12:17 rectangle or a 1:√2 one (it would be hard to detect the difference). In the first case, the constructed shape is only approximately a kite; in the second, an exact kite is possible, but the designated cells don’t coincide perfectly on folding. 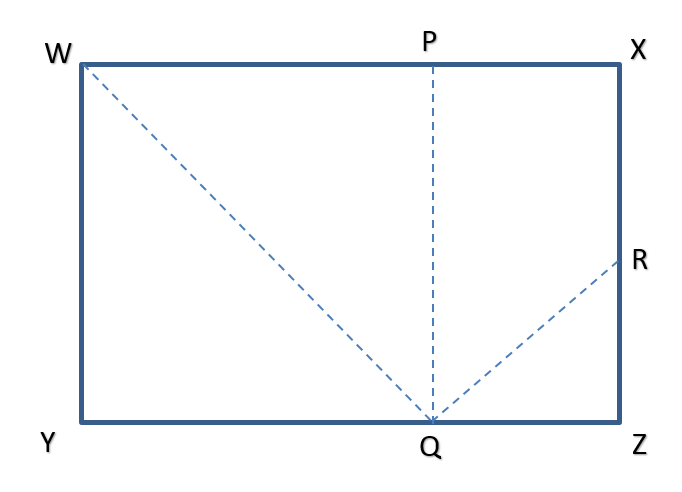 Chambers doesn’t provide the geometrical definition of a kite, which is a quadrilateral in which a diagonal is a line of symmetry. The kite shape in this case did not have the perfect angles for a traditional kite toy, though hopefully the family resemblance was strong enough for solvers not to worry too much. … it is really only necessary to observe that angle WQR = angle WXR = 90° and that if WY = 1, then WQ = √2 (via Pythagoras in triangle WYQ), so that the right-angled triangles WQR and and WXR share a common hypotenuse WR and have WQ = WX = √2, so they are therefore congruent. Thus WXRQ is a kite with symmetry line WR. People who enjoy playing with square roots may find it satisfying to note that QZ = ZR = √2 – 1, so that XR = 1 – ZR = 1 – (√2 – 1) = 2 – √2, and (by Pythagoras in triangle QRZ), QR = (√2)(ZR) = √2(√2 – 1) which also multiplies out to 2 – √2, thus verifying directly that QR = XR. Many, many thanks to all who have helped with and commented on this puzzle. I have not gone back to check which of the clues that people have kindly complimented were actually the work of my wonderful test solvers or of the equally wonderful Listener vetters, but I do know that the final preamble (there were many drafts) was infinitely clearer and more concise than anything I could have come up with on my own. This entry was posted on 14 January 2018 at 10:30 am	and is filed under Setting Blogs. You can follow any responses to this entry through the RSS 2.0 feed. You can leave a response, or trackback from your own site. I know the maths won’t be of interest to everyone, by the way: luckily it wasn’t essential to solving the puzzle. Sorry about the missing sentence, Zero. I hope to be seeing John this Saturday, so shall pass on your apologies. Knowing him, he would just have taken it in his stride. Thank you Dave, much appreciated!